Preparation: Little advance preparation is needed for dental bonding. Anesthesia is often not necessary unless the bonding is being used to fill a decayed tooth. Your dentist will use a shade guide to select a composite resin color that will closely match the color of your tooth. The bonding process: Next, the surface of the tooth will be roughened and a conditioning liquid applied. These procedures help the bonding material adhere to the tooth. The tooth-colored, putty-like resin is then applied, molded, and smoothed to the desired shape. An ultraviolet light or laser is then used to harden the material. After the material is hardened, your dentist will further trim and shape it, and polish it to match the sheen of the rest of the tooth surface. Time-to-completion: Dental bonding takes about 30 to 60 minutes per tooth to complete. 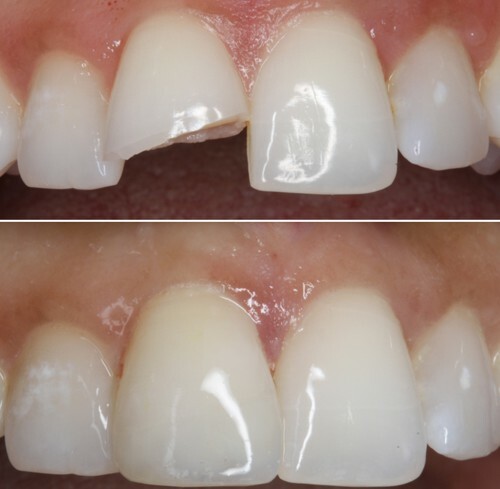 Advantages and Disadvantages of Dental Tooth Bonding? Advantages: Dental bonding can usually be done in one office visit unless several teeth are involved. Les tooth enamel is removed than with some other procedures, and unless dental bonding is being performed to fill a cavity, anesthesia is usually not required. Disadvantages: While the material does resist some stains, it is not as stain resistant as crowns. The bonding materials do not last as long nor are they as strong as other restorative procedures, such as crowns, veneers, or fillings. Additionally, bonding materials can chip and break off the tooth. Find a Dental tooth bonding dentist near you!